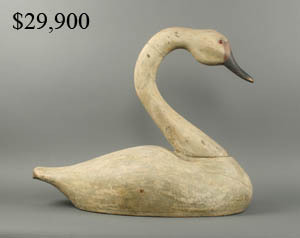 600+ lots. 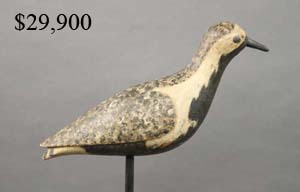 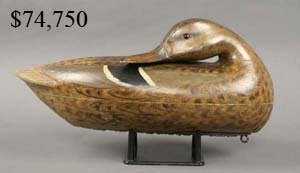 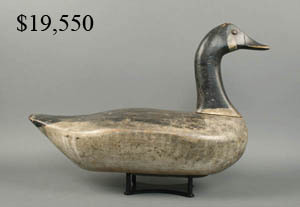 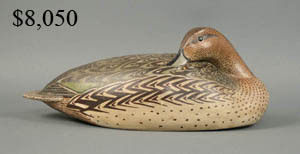 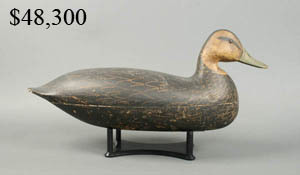 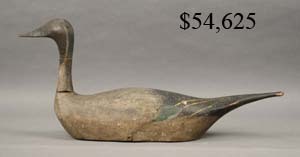 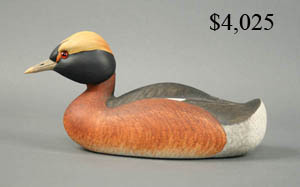 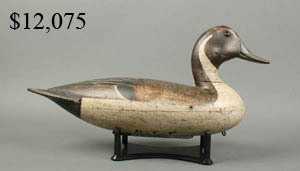 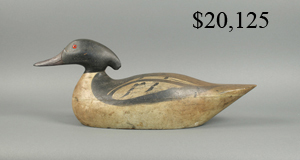 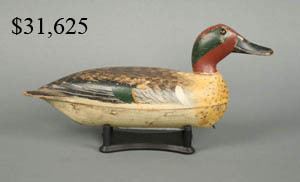 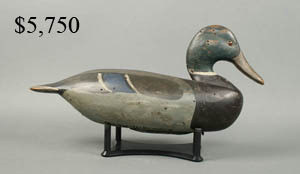 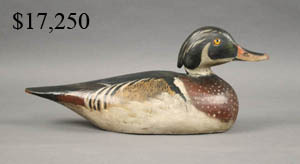 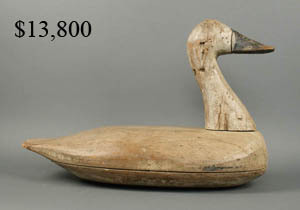 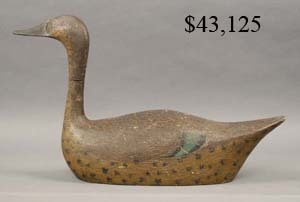 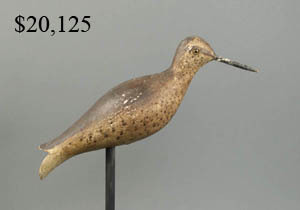 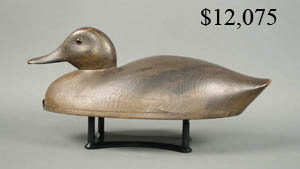 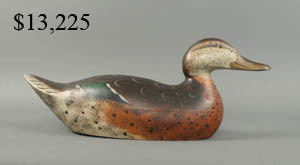 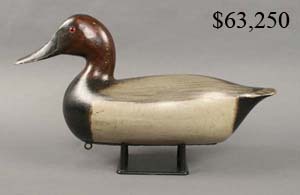 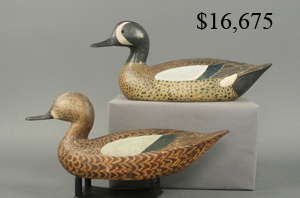 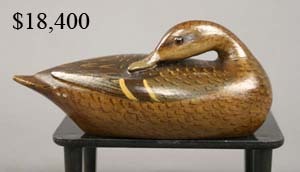 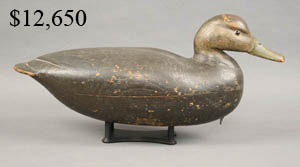 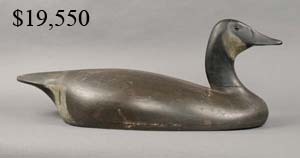 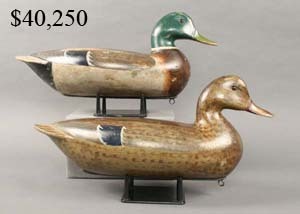 Featuring decoys from the collections of David Galliher, Joe French and Dr. George E. Moore. 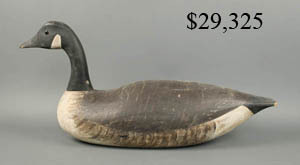 Gross sales $2.1 Million. 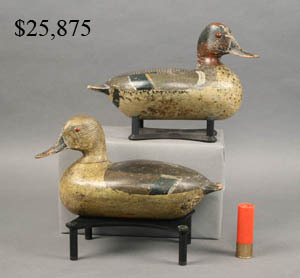 St. Charles, Illinois - Guyette & Schmidt, Inc. conducted their 24th annual spring decoy auction on April 23 & 24 at the Pheasant Run Resort in St. Charles, Illinois. 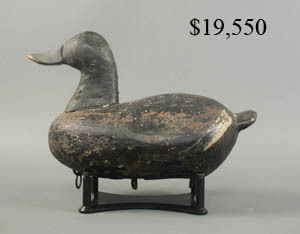 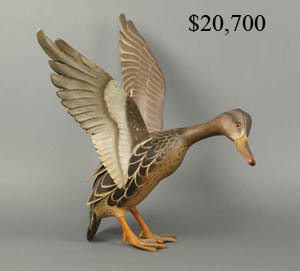 The auction was held in conjunction with the National Antique Decoy & Sporting Collectibles Show and grossed $2.1 million. 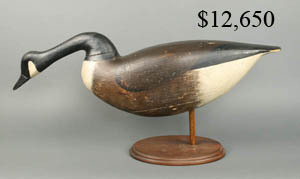 The sale pushed Guyette & Schmidt, Inc. total auction sales to over $117,000,000. 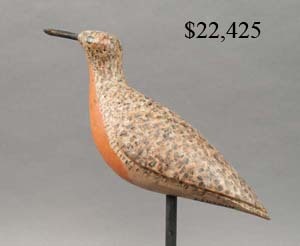 The crowd was quite large with 325 registered bidders in the audience, another 180 people bid by phone, absentee or online. 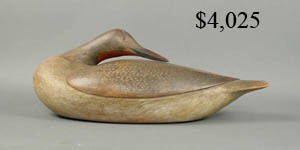 Prices were under estimate on the first day but near mid estimate on the second day, 51 lots ssold for over $10,000. 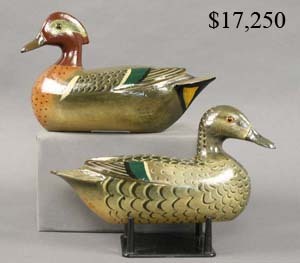 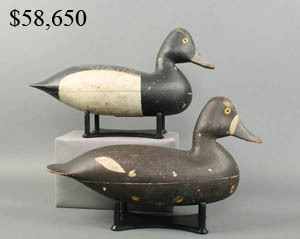 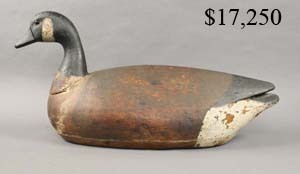 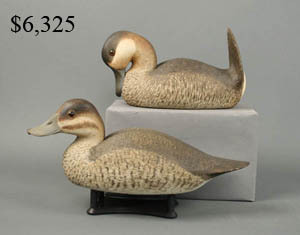 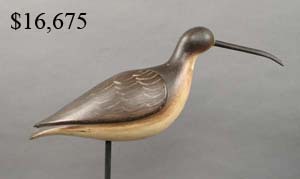 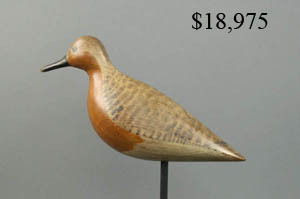 A pair of long necked pintails circa 1900 by an unknown maker from Kankakee, Illinois sold under estimate for $97,750. 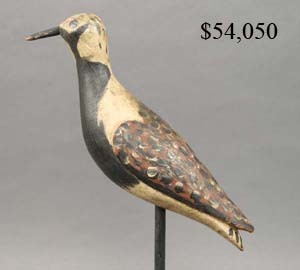 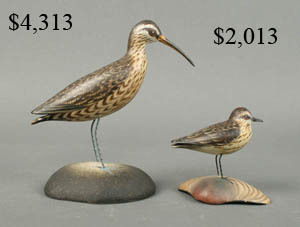 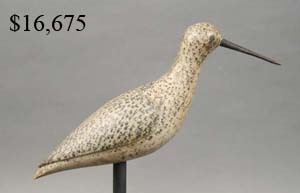 A group of 5 very rare shorebirds by Daniel Lake Leeds of Pleasantville, New Jersey sold over estimate at $140,000. 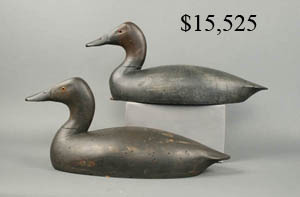 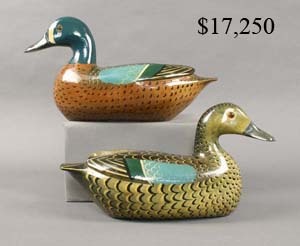 Decoys by Charles Perdew brought high prices at the sale. 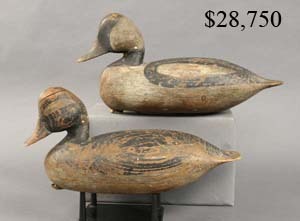 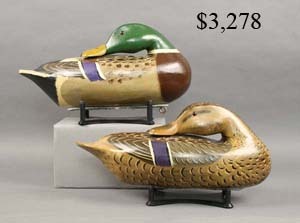 A sleeping mallard hen sold for $74,750, a canvasback drake for $63,250 and a pair of mallards for $40,250. 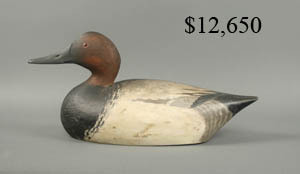 Canada goose by Nathan Cobb, Jr.
Ruddy duck by Alvira Wright.